The article substantiates the need to use new approaches in describing the regional economic security including the institutional theory. We argue the importance of economic security for overcoming governance imperfections. Moreover, it is significant to a new paradigm unifying various theories that differ from one another according to methodological features — substantive, functional and axiological ones. In the modern theory of socio-economic development, more attention has been paid to the regional economic security and its institutional explanation. The purpose of the article is to study the economic security of a region through the prism of institutional factors. These factors allow revealing internal features that determine the nature of regional economic security. However, studying these factors using traditional economic theory remains less accessible. The research hypothesis supposes that our method of studying the economic security increases the effectiveness of scientific analysis. Moreover, it allows to identify a region as a complex phenomenon where universal standards of market behaviour can be considered as the special cases of economy. 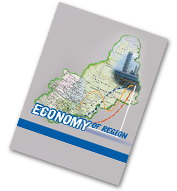 In this regard, the research contributes to the concept of regional economic security. We consider a region using the French «theory of agreements». The application of the theory of conventions allows to re-formulate the concept of the interaction of regional government bodies with a multi-institutional object of regulation. This is a typical for addressing the issue of economic security of northern regions where the problem of market behaviour has more acute and painful form. The outcome of this work can be used as a guide for the modernization of regional governance.